It has been a while that I am craving for a pull-apart garlic bread. It is everywhere on internet and it makes me soooo hungry. But there is no way I eat so much bread! So today I found a super deal on eggplant at the market – 2 eggplant for $5! I look at those big and fat beautiful eggplant and suddenly I thought ‘this will be my low carb garlic bread base for tonight!’. I was not too sure on how it will hold together as eggplant can soften very fast when baked in the oven. But lucky me the result was exactly as I was dreaming about. 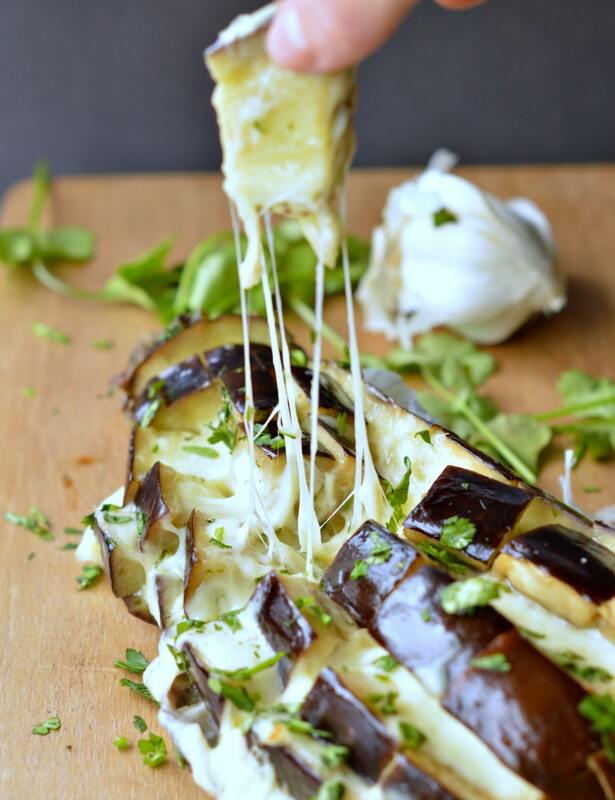 Big bites of baked eggplant with lots of string cheese. I actually can not believe it was not bread. It was so soft and it melt in my mounth as a buttery garlic bread does. But well this recipe is not the healthiest recipe ever as it does contains a large amount of grated mozzarella. But at least my healthy move was to use a vegetable instead bread and to make an olive oil garlic & coriander marinade instead of butter. It was really amazing. Below I listed some steps by steps pictures of this recipe to guide you through this process. It is a bit messy to prepare as you will have lots of marinade and cheese all over the benchtop but it worth it! Oh and yes my little toddler loves it too and trust me she is not the kind of little lady who love eggplant ! So another mum trick to make eggplant her fav! Last thing! If you want to make a similar recipe with no dairy and low calorie do not add cheese and instead stuff the eggplant with lots of minced fresh herbs mixed in tomato paste. Follow the same baking instruction, wrap the eggplant into a large piece of foil and close very well to avoid the moisture to goes out. It will be delicious too ! Wash the eggplant and dry with a towel or absorbent paper. In a mixing bowl add the olive oil, chopped coriander, finely crushed garlic - I used a garlic press like this one: Garlic Press and Peeler Set . It makes a very thin garlic paste and avoid garlic bites into the mixture. Adjust with salt and pepper if you like. 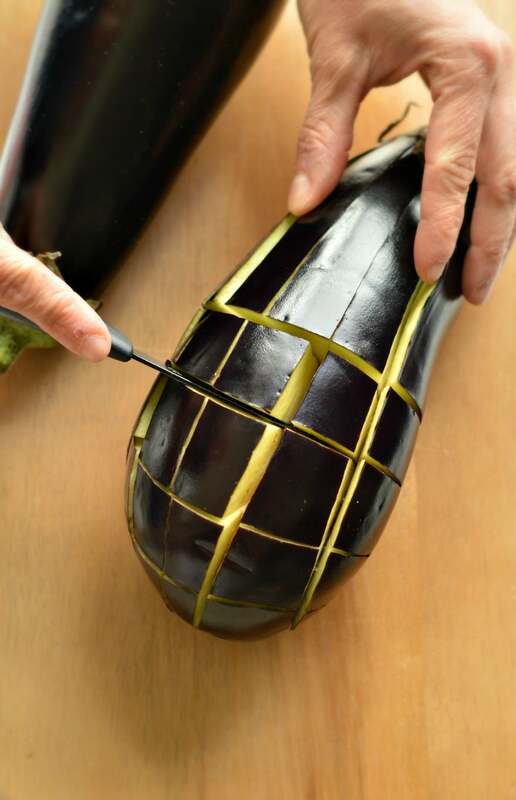 Using a small and sharp knife cut lengthwise lines into the eggplant but do not cut all the way through the eggplant like you do for a classic garlic bread. Now cut line on the opposite side to makes cubes. Same here do not cut all the way though as you do not want to cut the bottom of the eggplant. 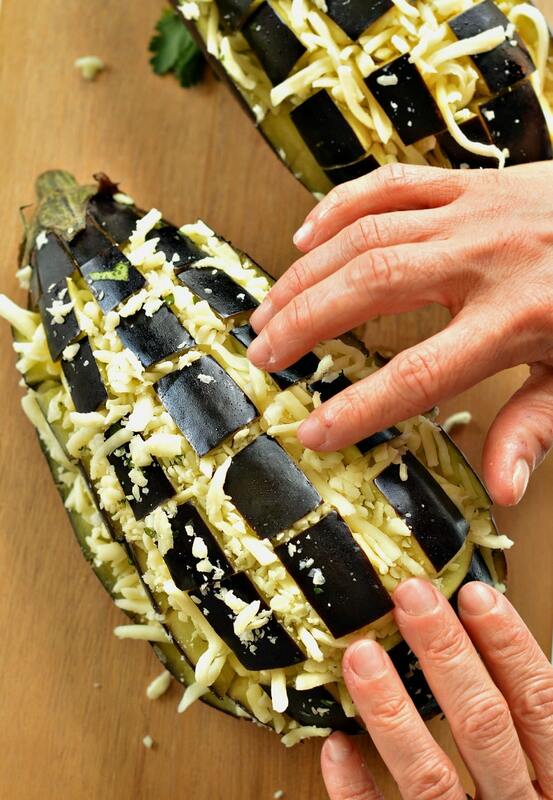 Use your finger to gently open the cracks between each eggplant cubes and using a teaspoon insert the garlic olive oil mixture into each cracks. You can also use a silicon pastry brush like this one: Small Silicon Pastry Brush it helps to spread the mixture at the bottom of each cracks and get the flavour all around the eggplant. Proceed the same way to insert the grated cheese. It is a messy process and you have to proceed carefully gently stuffing each cracks with cheese without breaking the eggplant cubes. Place the stuffed eggplant ontp a long piece of thick aluminium foil paper and wrap the eggplant into foil. Leave some space on the top to avoid the foil to stick to the melting cheese. Close very well as you want to keep the moisture into the foil paper papillotte. Using thick foil paper accelerate the baking process keeping the warm into the papillotte. 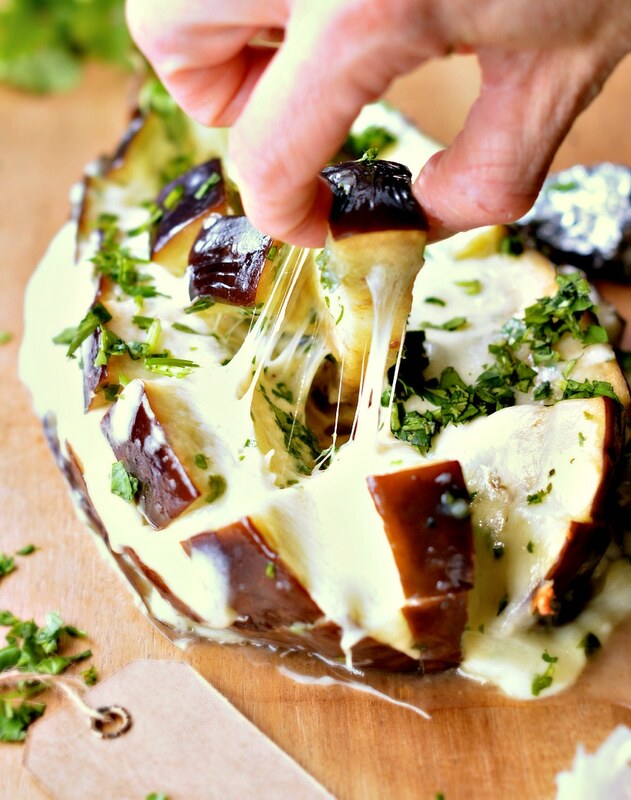 Bake for 20-25 minutes or until the eggplant is soft and all the cheese is melted and runny. Remove from the oven and serve on a plate. Let cool down for 5 minutes before eating as it will be very hot. 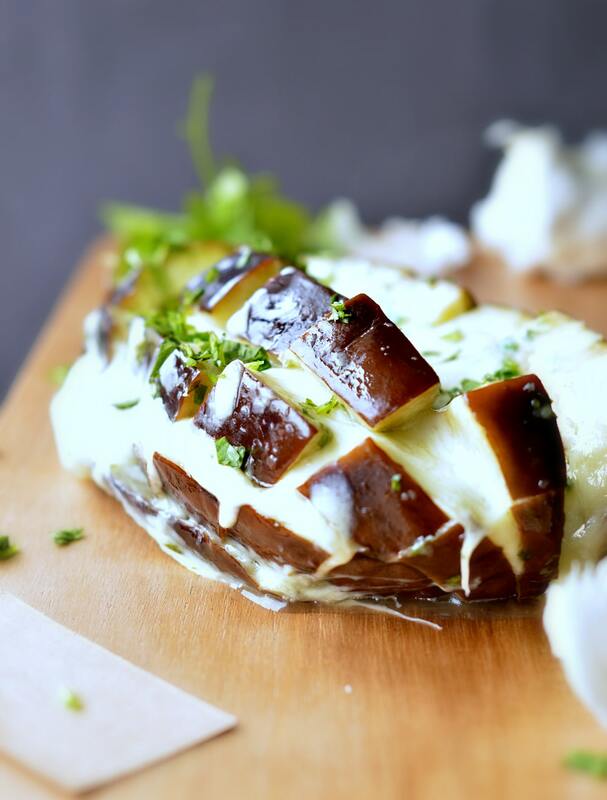 You can prepare those eggplant 24 h before and bake them before serving. Simply stuff the eggplant, wrapped in foil and store in the fridge until needed. How about the bitter taste which is often present when cooking with eggplant unless the slices are salted and drained? 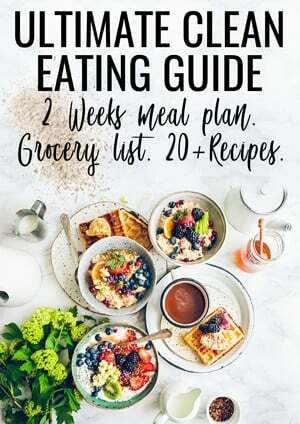 Hi Valerie, I never found eggplant bitter and I cook eggplant in many dishes like ratatouille without adding a salt/drain process. In this recipe the eggplant is wrapped in foil then baked. The foil maintain the moisture coming out from the veggie and spread the garlic olive oil flavour from all around the eggplant. It taste absolutely amazing to me, a lot like garlic bread. If you love eggplant try this you will be surprised it is delicious! I too have never salted eggplant [brinjal] I cook slices of eggplant in a flat pan in the oven with garlic butter. publish my e-mail if you want! Pardon, je ne parle pas bien, mais cette recette est BRILLIANTE! Je le fait ce soir et je ne peux pas attendre pour faire à nouveau!! Merci! Hi Sara, thank you for putting so much effort to write in my birth language! it means a lot to me. Your French is really good! J’espere que vous aimerez cette recette d’aubergine au four. Elle as beaucoup de succes avec ma petite fille de 3 ans. A bientot sur le blog pour d’autres recettes ! Carine. Where can I find fresh coriander ? I never see it at the market, and on the spice isle it is ground seed. Hi Teresa, I am not sure where you live but if you are based in New Zealand too I buy coriander from any Pak n Save or Countdown (Woolworth) store. It is usually sold in the fridge where you buy packaged lettuce. You can also buy a plant for few dollars in a plant store. It grows easily in the kitchen. However, if you don’t find coriander I recommend to substitute with parsley or basil. It goes very well with eggplant too. Enjoy! Might be worth noting that coriander leaves are known as cilantro in many parts of the world, I assume that is what is wanted for this recipe? Or rather cilantro seeds are known as coriander? Yes Rob I used coriander leaves but as I am French I did not know that some others part of the world use the word cilantro. I will update that in the recipe for sure! Thanks Rob for this great input 🙂 Carine. In the US it is usually in the fresh vegetable area wirh tbe fresh parsley It is called Cilantro. Amazing ! thanks for adding this precision. XOXO Carine. Hi, I was wondering if you could use jarred pesto sauce in place of the oil mixture? Hi Susan, I am sure it will work. It is a great idea and it will even had a lovely taste to the eggplant! It may change the cooking time – you may have to cook the eggplant longer – as olive oil is slightly more moist. Enjoy ! Carine. Whenever I have cooked eggplant in the past, I have always peeled the skins…Do you eat the skins too? Do you think it would work good with peeling it? Or would it not cook well? I love eggplant skin. When it is well cooked in the oven it gets tender and soft. I never tried this recipe peeling the eggplant – I am not sure if the eggplant flesh will hold well without the skin. If you try let me know! It is an interesting experience. Enjoy the recipe on the blog! Carine. I tried mine with parmesan cheese and it was lovely!!! a full family hit!!! had to bake it longer though, a full 45 minutes! thank you!! Hi Andrea, Parmesan looks like a great combo with eggplant. I must try next time! I guess the baking time really depends on the eggplant size too. I noticed that if I have a hue eggplant it took longer too. Thanks for trying my recipes and sticking around with me! xoxo Carine. Hi Wanda, I don’t have a slow cooker so I am not sure how it will cook in there. I am worried that a slow cooker soften too much the eggplant and that you won’t be able to pull appart the bites on the top. Let me know if you try though ! I am sure that many others readers would love to use a slow cooker for that recipe 🙂 Thanks for reading the blog and testing my recipes !!! xoxo Carine. It’s not bread? Why the misleading title? It is not a proper bread but when you are on a low carb diet you don’t eat regular bread. You tend to call ‘bread’ anything that looks like a bread with the same taste without the carbs! 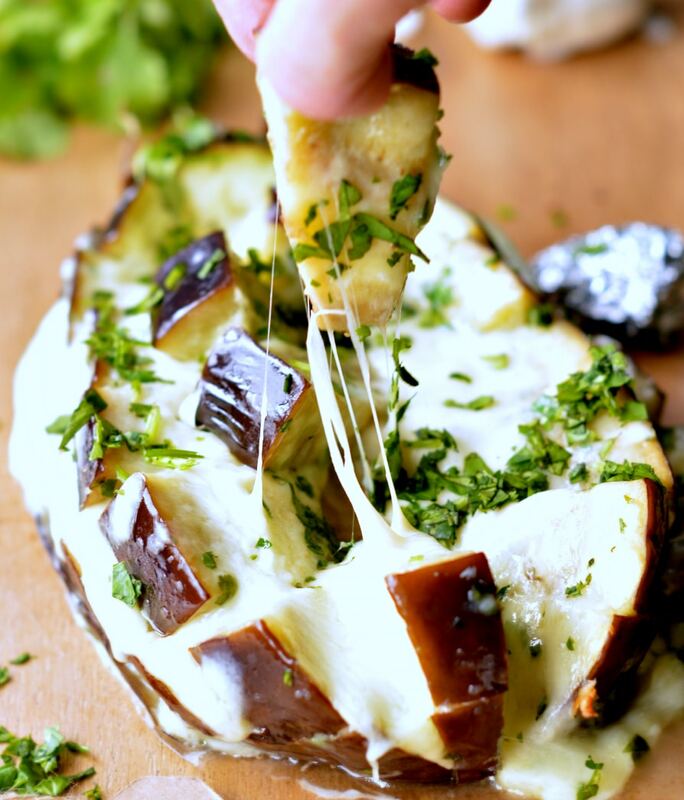 That is exactly what this pull appart eggplant garlic bread is about. It taste like garlic bread but there is no carbs! It probably means that your eggplant was bigger than mine and required a longer cooking time. It is great to check the texture by opening the foil, prick with a knife and see. If it is not soft and moist, close the foil again and return to the oven by extra 10 minutes burst. That is what I would recommend to get the eggplant soften, moist and juicy. Enjoy the recipes on the blog and thank YOU so much for trying out some of them. XOXO Carine.